Insomnia and disturbed sleep patterns can be infuriating, and over time can seriously affect our day-to-day lives, work, and relationships. Whether suffering from a sleep-related disorder, physical condition, hectic lifestyle, or a simple inability to ‘switch off,’ 1 in 3 of us have experienced it at one time or another. Statistically, 30-40% of all adults suffer with insomnia or disrupted sleeping patterns over the course of any one year, and of these around 60% have a chronic disorder. Lying awake as the rest of the world slumbers on can be incredibly frustrating, and sleepless night after sleepless night can have a significant impact on our physical and mental well being. Whatever the cause of your restlessness, the negative impact on quality of life can be huge, affecting our relationships, professional life, health, and general happiness. Aside from that general feeling of exhaustion, poor quality sleep (or a complete lack of it) can lead to reduced concentration and motivation, slower reaction times, weight gain, depression, mood swings and even increased risk of long term conditions such as high blood pressure and heart disease. Although there is a lot of advice out there for dealing with insomnia (sheep, anyone?) it can be tough to get the better of, especially if caused by an underlying condition such as sleep apnoea, snoring, parasomnias, or restless leg syndrome. Sleeping pills may provide a temporary relief for some, but for most individuals the side effects and addictive nature of these medications can make them a non-viable option for long term use. Update: The buy 2 and get 2 free deal is still available. Marz Sleep Spray is an all-natural, convenient, and highly effective solution for those suffering from sleep deprivation. Fast-acting and effective, just a few sprays into the mouth or a drink before bed can produce a restful and complete night’s sleep that leaves you waking fresh, restored, and alert. Users of Marz Sleep Spray have found themselves able to fall asleep more quickly and stay asleep for longer, providing a welcome relief from long and tedious nights of tossing and turning. But why choose Marz Sleep Spray over other remedies? Inositol: Naturally occurring in many plants, inositol is known to reduce stress and therefore improve sleep quality. Valerian Root: A natural treatment for restlessness. Lemon Balm Leaf: Fragrant and inherently calming, lemon balm leaf is commonly used to treat stress. Melatonin: One of the ‘happy hormones,’ melatonin also prepares your body for sleep and regulates your sleep cycle. Gaba Root: Clinically proven to have a sedative effect, Gaba Root is excellent for relaxation. 5-HTP: Another plant-derived ingredient, 5-HTP is primarily used to alleviate stress and anxiety, promoting a good night’s sleep. Although powerful, the natural ingredient list means this formula is automatically kinder to the body than other treatments, and has the added benefit of being non-addictive. Therefore, Marz Sleep Spray is suitable for use over longer periods of time than other sleeping pills, making it a perfect solution for those with long term sleep disorders. The benefits of that all-natural ingredient list become even more apparent the day after use. Traditional sleeping pills can cause a whole host of unpleasant side effects, including stomach pain, memory problems, dizziness, GI problems and heartburn, which is a hefty price to pay for a good night’s sleep! When used over long periods of time, sleeping pills can have significant negative impacts on health, and can be highly addictive. Marz Sleep Spray is gentle on the body and non-habit forming, meaning it is suitable for use over much longer periods of time. Furthermore, users can expect to awake feeling refreshed, rested and alert, with none of the unpleasant after effects associated with other treatments. Compact and portable, the Marz Sleep Spray can be easily stored and transported, and is so simple to use. Up to seven sprays into the mouth (or your bedtime cocoa) and that’s it, which will be welcome news to those who have trouble swallowing pills. The flexibility in dosing means that you can take as much or as little as you need to doze off, rather than taking a fixed amount. Another benefit of using oral sprays over pills is their increased rate of absorption – whilst pills take time to break down and dissolve, this liquid formula is far more fast acting, meaning you can drop off quickly after using it. With no need for prescription, Marz Sleep Spray is readily available and easily obtained online. Absolutely! On average, consumers have found that Marz Sleep Spray takes effect around 30 minutes after use, making it a fast-acting remedy for sleeplessness. Consumers report a better quality of sleep, more restful sleep, and increased duration of sleep. Those who have tried Marz Sleep Spray awaken the next morning feeling rested, refreshed, alert, and active, with none of the unpleasant side effects associated with traditional sleeping pills. High quality sleep is crucially important for maintaining physical and mental wellbeing, and the benefits of a more restful night are clear to see. With increased sleep quality, you can expect to enjoy improvements in mood, productivity, alertness, brain functionality and even appearance! Looking to the long term, improved sleep quality can lower stress levels, improve memory and even increase life span. With Marz Sleep Spray, a good night’s sleep and all the associated health benefits are attainable for everyone, even those with long term sleep disorders. Avoid stimulants such as caffeine and nicotine after 6pm. Avoid reading from/looking at backlit devices at night time. A few – Marz Sleep Spray is not recommended for use by persons under the age of 18, and is only available online. 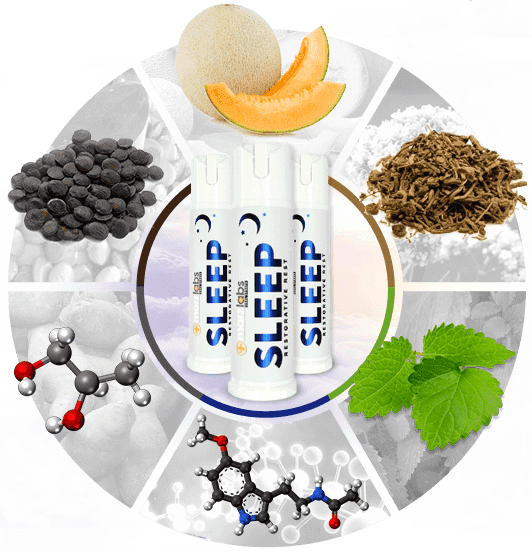 Featured on SharkTank has boosted the popularity of this sleep spray and this formula has been clinically recommended by established Doctors and has been proven to have no habit-forming properties or harmful side effects on the body. If snoring is your problem, take a look at our anti snoring devices. If you or your partner need help with sleep we recommend Marz Sleep Sprays.